To the left we see part of a malicious email. The author brags about how the From address is the same as the To address. This is supposed to mean that the author has broken into my email account. I have been waiting patiently for someone to mail one of these to me. Now I can use it as an example. I’ll show you how to uncover it as a fraud. A while back I posted an article about tracing an email. This is especially useful when the email FROM address may have been forged. This one was a particularly clumsy forgery. As described in the email tracing article, every email contains two parts: a text header section, followed by a single blank line, followed by the email’s contents. 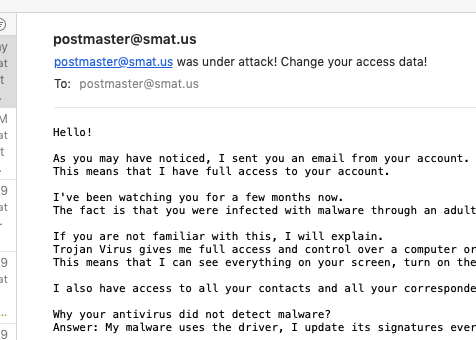 Subject: postmaster@smat.us was under attack! Anything created by the client may be forged. Anything. This claims to me from MIcrosoft Outlook Express, but we have no real proof. This confirms for me that I didn’t send the email. The domain name and numerical host addresses are both from Vietnam. I don’t have access to email clients in Vietnam. I may have still been hacked. The header doesn’t show whether people at this address had themselves accessed my account. This email was sent from a legitimate “smat.us” email address. My account doesn’t even allow the “postmaster” address to send email. A security geek might ask why the wrong From address produces a “neutral” answer instead of a “fail.” The neutral answer provides a vital bit of flexibility. Until everyone uses SPF the same way, I might find myself sending email through a different email server: one that doesn’t handle my email authentication correctly. If I tighten down the email policy, I might prevent myself from sending email in some circumstances. I’m including the Bitcoin wallet because it’s a unique identifier that lets us track specific instances of this scam. I also got one of these a few days ago; in my case, the SMTP data showed a .rs (Republic of Serbia) domain. It won a 32.2 SpamAssasin score! The email described above won a 44.2 score. Beat ya!